It’s been a mixed month for the Pronto bike share system. The bike share just celebrated its first year and is getting heavy scrutiny for what some see as under-performing metrics. In late October, the Seattle Department of Transportation (SDOT) announced they did not receive the TIGER grant funding that they were hoping for. That TIGER grant would have helped fund a massive expansion of the system across more of the city. SDOT was planning to combine the $10 million grant with another $5 million from the City’s transportation budget to get bikes in more neighborhoods. The $5 million looks likely to remain in the budget, but some council members don’t appear entirely sold on the idea. Meanwhile, Move Seattle appears headed to a resounding win at the ballot box, which will all but ensure that our Bike Master Plan gets fully funded. That’s good news for bike share riders. Everyone is asking, what does the future of Pronto look like? The City has clearly indicated that it intends to make the Pronto bike share an integral part of our transit system, and that it wants to invest in neighborhoods where Pronto could not itself expand if it remained a for-profit entity. But before that happens, a reevaluation of the existing stations is needed. Is their placement serving the most possible users? Is it as easy as possible to get between a station and our bike infrastructure to attract riders? The answer right now is a clear no. In so many cases, the time penalty created by placing Pronto stations in out-of-the-way corners is great enough to cause some people to skip the trip. In other cases, station placement on a street that is not bike friendly or doesn’t go the right direction is a hindrance. Of course, compromises will have to be made due to a lack of infinite space Downtown, but taking a quick look at where stations are now, it’s obvious that we can do better. Let’s take Downtown Seattle Transit Tunnel access as a high-profile example. This high capacity portal should be near the top of the list when it comes to destinations for a bike share system to serve. When the system launched, there was only one Pronto station on the same block as a tunnel entrance. That happened to be the Sher Kung Memorial bike station outside of the University Street Station (on Second Avenue and University Street). After the board of the War Memorial located on this block complained, the station was moved two full blocks away — nowhere near a station entrance. After that change, the closest station to a Downtown tunnel station is probably Second & Pine. This station is one block away from the Second Avenue two-way bike lane and a block and a half away from Westlake station. 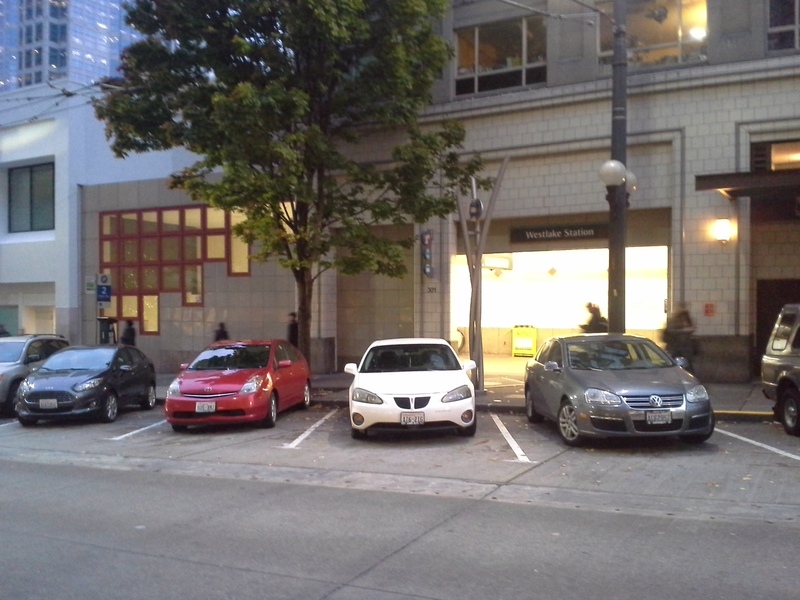 Meanwhile, in front of Westlake Station, SDOT recently replaced an island for buses with…back angle parking. We should be thinking more creatively here about what the best uses around heavily traffic transit stations are. A Pronto station right in front of Westlake would make it much more tempting to transit riders. Back-in angle parking in front of Westlake Station. Pronto recently made an encouraging change in the University District, moving a station from an internal corner of campus to the newly reopened Montlake Triangle. That station is also conveniently right next to the pedestrian bridge leading to the new light rail station’s entrance. The station placement here makes sense, is highly accessible to transit riders and students alike, and should stay put. It is my hope that we can reconfigure more of our stations with the future expansion of the system in mind. With SDOT likely to take full ownership of the system, we should think about Pronto stations holistically and take route interaction seriously. This will make the system more attractive to new users and really help Move Seattle. Full disclosure: I ride Pronto daily and am fully invested in its expansion, having clocked 800 miles on a green bike in the first year. There is a station right outside Convention Place Station. I’d use it every now and then when I need to catch a bus to the ‘burbs, but not often enough to justify a yearly membership, and of course a day pass is rarely justifiable at the price. Fair point- I was considering light rail stations here. 9th and Pine is a good station right now also because it’s where the bike lane stops (though I wish it didn’t). So I plotted the trips per day to and from the moved dock and some of the one I thought were similar. I also did a 7-day moving average to filter out the significant daily fluctuations. I honestly couldn’t even see they day it moved in the data, which surprised me and makes me wonder if I’m looking at the right station. The station that moved had slightly lower usage long term than the other two stations, but nothing that wasn’t dwarfed by other factors. The move happened soon after the system opened and during winter, so that might also have something to do with it. I can provide the scripts or the tables I used if anyone wants to check my work. I’m beginning to think station density is to bike share what frequent service is to a bus network. A better test might be to see what happens in the University sub-network (effectively only about 15 stations) when U-Link opens. Seattle Transit Blog is worried the new dock there will be swamped, but I think it will only see a small uptick because there’s not many places to ride once you get there. Somewhat off topic, but the Pronto data challenge entries are available for the “people’s choice” voting. There’s a ‘click here’ message in the blue bar at the top of their home page with the survey and links to all of the projects: https://www.prontocycleshare.com/ . I didn’t see any that would directly address this question, but I might have missed something. 9th and Pine does get a lot of daily use, but it’s also very well connected to other stations (40-ish within a 15 minute ride). I used it all the time via express buses from Northgate. But I only started using it daily when I moved to an office that was right by a Pronto station. Lately I’ve switched to using my personal bike to commute via Lake City Way express buses that let off in the Convention Center underpass and pick up at 6th and Pike. The dock at 7th and Union works for those when I do take Pronto. That dock also has connectivity to 40+ stations and is one of the busier docks even though there aren’t any bike lanes within a few blocks. I think the Pronto data dump has continuous data for stations even if they got moved. Depending on how long it was around it might be possible to compare its performance before and after the move compared to a similar station (9th and Pine maybe, or Westlake and 6th, even the low-connectivity/low-performance UW docks near the campus transit bays) that didn’t move. I don’t know what to expect, but I’m guessing there will be a big initial dip in performance and then you’ll see a small continuing percentage of lost trips relative to the other stations. If station density is the bigger factor, though it’s possible the station fully recovered. When I get some time, I’ll see if I can put that chart together. Let me start out by saying I agree that good station placement is important and placement near the tunnel and transit centers is a great idea. On the other hand moving one particular station closer to one set of users may just move it farther from another set of users. I did some quick queries for the data challenge, and it looks like the downtown and capitol hill stations are doing about as well as stations in other cities given that they can reach 30 or 40 other stations within 15 minutes (there are only about 50 in the whole network). The stations by UW appear to be limited more by their small network than by specific placement. That said, it’s probably possible with the trip data to find stations that are under-performing relative to their neighborhood. It’s possible I made a mistake in the numbers, but at first glance our stations seem to be performing similarly to 30-or-40 destination stations in Minneapolis, Chicago and elsewhere as far as daily trips per station go. Those are considered to be successful systems, so the limiting factor here is the size of the network (or sub-networks if you consider UW). Expanding it (while maintaining sufficient density) should really help increase the usage. Pronto does have a suggest-a-station tool at http://suggest.prontocycleshare.com . Keep in mind that networks with high usage have densities of 4, 8 or upwards of 20 stations per square mile, so don’t be shy. Right by transit hubs are a great place to suggest stations. As part of the Pronto Data Challenge we have set up a “Databrowser” — an interactive data analysis tool that allows users to thoroughly interrogate Pronto’s first year of trip data on a station-by-station basis. I hope that any discussions of station placement will be based on a careful analysis of the existing data. We have done our best to make such analysis as easy and intuitive as possible. I’m still looking for data on ethnicity and economic status of Pronto riders. My observations are that users are disproportionately white and economically well-off, but I’d love to be proved wrong. Wow- I could spend all day on there. But I do wonder about using this data to expand or reconfigure, since it doesn’t really tell you much about how the system is being *used* in terms of actual destinations. Or what users want to see from it that they aren’t currently getting.